Chains just arrived from the Melbourne Race Track. He also raced briefly at Flagler and Mardi Gras tracks, but wasn't able to win one race at either. He was fast enough to place in the few races he did race though. After being moved to Melbourne they entered him in two schooling races and he refused to even run. Since Chains is the rare greyhound that would rather not chase the lure. When he met cats and small dogs he didn't want to chase them either, so would be fine to live with either. 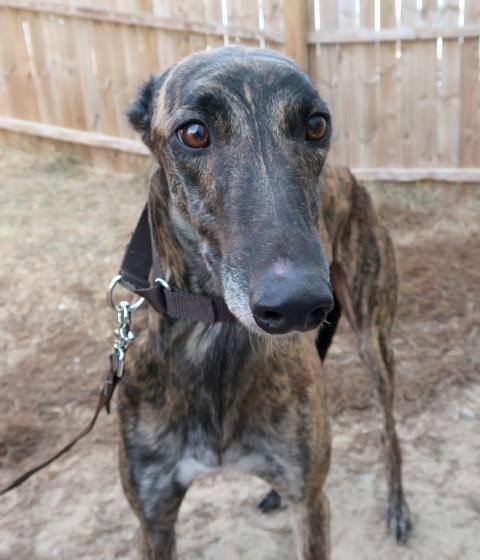 Chains is a 75lb brindle male that turned 2 on September 10th. His Sire is SH Avatar and his dam is DK"s Send All. Chains was very concerned about slick floors and didn't want to walk on them at all so will need some coaching there. He is a friendly happy guy that likes people.